[S182] Social Security Death Index (on-line), Ancestry.com, SSDI, Ancestry.com, SSAN 480-12-8531. Thomas Snodgrass died on 14 March 1886 at May Twp., Lee Co., IL. [S587] D. A. York, "Ira Matoon Ellingwood," e-mail to James H. Holcombe, 22 July 2004. Raymond Thomas York was born on 27 February 1900 at Chicago, Cook Co., IL. He married Kathryne Mary Armstrong, daughter of Willard Warren Armstrong and Sarah Alvira Wynkoop, on 8 May 1926. Raymond Thomas York died on 26 October 1962 at Wayland, MI, at age 62. He was buried at Elmwood Cemetery, Wayland, MI. Bob was one of the founders of Scientific Atlanta. [S182] Social Security Death Index (on-line), Ancestry.com, SSDI, Ancestry.com, SSAN 310-18-9211. Edith Kermit Carow was born on 6 August 1861 at CT.1 She married President Theodore Roosevelt Jr., son of Theodore Roosevelt Sr. and Martha Bulloch, on 2 December 1886 at St. George's Church, London, England.1 Edith Kermit Carow died on 30 September 1948 at age 87. Children of Edith Kermit Carow and President Theodore Roosevelt Jr.
Jedediah Bliss was born on 7 February 1709 at Springfield, Hampden Co., MA.1 He was the son of Ebenezer Bliss and Mary Gaylord.1 Jedediah Bliss married Miriam Hitchcock on 19 August 1748.1 Jedediah Bliss died on 30 November 1777 at Springfield, Hampden Co., MA, at age 68. Nathan and Margaret were enumerated in the 1850 Athens, Clarke Co., GA, federal census. He was a Presbyterian Minister, age 57; she was 55. Children in the household were Louisa 20, William 18, Henry 16, Robert 14, and Margaret 11. Rev. Samuel Edward Axson was born on 23 December 1836 at Liberty Co., GA.1 He was the son of Rev. Isaac Stockton Keith Axson and Rebecca Longstreet FitzRandolph. Rev. Samuel Edward Axson married Margaret Jane Hoyt, daughter of Nathan Hoyt and Margaret Bliss, on 16 November 1858 at Savannah, Chatham Co, GA.1 Rev. Samuel Edward Axson died on 28 May 1884 at age 47. S. E. and Margaret J. were enumerated in the 1860 Beach Island, Edgefield Co., SC, federal census. He was a clergyman age 23, she was 21. the only child in the household was Ellen L. 3 months. They were enumerated in the household of S. G. U. Black, a planter. Rev. Isaac Stockton Keith Axson was born on 3 October 1813 at Charleston, Charleston Co., SC. He married Rebecca Longstreet FitzRandolph, daughter of Isaac FitzRandolph and Eleanor Hunter. I.S.K. and Rebecah were enumerated in the 1850 District 15, Liberty Co., GA, federal census. He was a clergyman age 36, she was 36. Children in the household were Edward 13, Randolph 12, and Sarah 9. Rebecca Longstreet FitzRandolph was born in 1815 at Charleston, Charleston Co., SC. She was the daughter of Isaac FitzRandolph and Eleanor Hunter.1 Rebecca Longstreet FitzRandolph married Rev. Isaac Stockton Keith Axson. from the National First Ladies' Library online. Ellen was 5’3” tall, with dark reddish brown hair, piled high in a pompadour style, away from her face, and brown eyes. She had soft, feminine features and a good figure. Later in life, as her health failed due to Bright’s Disease, she became somewhat puffy and appeared tired all the time. Her later photographs show a woman not well or in good spirits. The eldest of four children, born in Savannah, Ellen later moved to Rome, Georgia, which she always regarded as “home.” She was the daughter of a Presbyterian minister and both parents believed in education for girls as well as boys. Tutored at home by her mother, Ellen then attended the local female college (a.k.a. high school) and after her graduation in 1876, she continued to study. She studied French and German, and pursued her great love of art, showing great skill in both landscape and portraits. Ellen spent time studying art in New York City, which gave her a more expanded view of life. In the summer of 1883, Ellen met Thomas Woodrow Wilson at her father’s church and fell in love. Both were highly principled, motivated and widely read people who had deeply passionate and romantic hearts. Both Woodrow and Ellen were religious, she more open minded than he and both were to be deeply dependent on one another. Their early courtship was made more difficult due to Rev. Axson’s collapse and later commitment to an insane asylum, which was a drain on Ellen’s emotions and physical strength. Axson’s death on May 28, 1884, a probable suicide, saddened Ellen and made her question her desirability as a wife, but Woodrow overcame her fears. Using some of the money left to her by her father, Ellen returned to New York to study art at the Art Student’s League and on Sunday afternoons she taught African-American children at the city mission. She and Woodrow wrote each other of their hopes, dreams, and when he was offered a teaching position at Bryn Mawr College, they were able to marry. They married at her grandparents’ home in Savannah, the ceremony being conducted by her minister grandfather and father-in-law on June 24, 1885. Lonely as a girl, she chose not to pursue romance and became know as “Elly-Lou, the man-hater.” Her father thought her somewhat forward and often cautioned in her views. Her mother’s death in childbirth in 1881 changed Ellen’s life. Her father’s slow decline into depression and mental illness made her want to raise her siblings but her grandparents took over. Ellen was a strong woman with an artistic nature. She was a passionate woman who centered her life on home, husband, and children, but saw no reason why couldn’t pursue her love of painting. She felt that no one should surrender totally to the career of another. She was the perfect helpmate for an overly sensitive, often quarrelsome, and easily bruised husband. She was tactful, gentle, loving, and clear-eyed. She could also take up dislikes and was unforgiving to those who hurt her husband. She retained her love of reading and even translated works for her husband. She used her eye for beauty to furnish their home in Princeton. She was only able to do one thing at a time, whether sewing, painting, or reading. While Wilson never wanted to teach at an all girls’ school, the years at Bryn Mawr were wonderful for Ellen, in that she had three daughters, pursued French, German, political science and philosophy. She helped her husband with his research for his books. She also opened her home to her brothers and sister and helped her younger brother overcome his stuttering. The Wilsons moved to Princeton, New Jersey in 1890 where Woodrow taught history. In 1902, he was elected President of the University. Among those Ellen got to know in Princeton were former President and Mrs. Grover Cleveland. They both attended the funeral of the Cleveland’s oldest daughter, Ruth, who died in 1904. While at Princeton, it was Ellen who encouraged Wilson to go on lecture tours, encouraged his interest in politics, and ran the household and all of the finances. He was terribly dependent on Ellen and even the slightest shift in her moods could cause him to react negatively. They took trips to Europe to broaden their horizons. While there, Ellen was thrilled to see how liberated women had become and called the new century, “…the woman’s century.” Both Wilsons continued to study and share ideas together. The death of her youngest brother, sister-in-law, and their child in 1905 threw Ellen in a deep depression that threatened her centered life. As she struggled for religious faith, she also took up philosophy. Still, it was art that helped restore her faith. She joined an art colony in Connecticut, and she would pursue her painting until the end of her life. At some point, Woodrow formed a close friendship with a widow, Mary Hillbert Peck, a friendship Ellen later said caused her great grief. In 1910, after stepping down as President of Princeton (over a dispute with the college and its fraternities) Woodrow, with Ellen’s help, threw his hat into the political arena. It was Ellen who made sure that he met William Jennings Bryan who was instrumental in his eventual nomination as President in 1912. Elected to the Governor’s chair of New Jersey in 1910, Woodrow Wilson made a name for himself for his views on reform, which did not include suffrage. Ellen learned to be the perfect political wife: to be frank, honest, and know when to keep quiet. The election of Woodrow as President of the United States in November 1912 filled Ellen with joy and some fear. By them she knew she was not well, having been stricken with kidney problems since the birth of Eleanor in 1889. That winter she put on a one woman show of her paintings and had the thrill of selling over 25 of them. Ellen Wilson had but a year and five months in the White House. The second Mrs. Wilson would soon overshadow the public’s memory of Ellen, which is unfortunate because Ellen made her own contributions while First Lady. Her gentle manner and soft Southern drawl made the staff call her “the Angel in the White House.” She would be aided by all three of her daughters and her cousin Helen Bones, who served as her personal secretary. She also hired Belle Hagnar as her social secretary. She averaged over 41 receptions with 600 guests at each that spring and found time to redecorate the family quarters of the White House, including artwork from the Appalachians Hills. Ellen also oversaw the creation of the Rose Garden, bringing her gardener from Princeton to the White House. It was in the area of reform that Ellen Wilson made her greatest impact. On March 22, 1913, she listened as the head of the women’s department of the National Civic Federation told her of the plight of Black citizens in Washington. Two days later, Mrs. Wilson toured the city and saw first hand the slums of the nation’s capital. She also saw the working conditions of women in the Post Office, where they didn’t have sanitary facilities. Mrs. Wilson had difficulty in getting the attention of the President’s advisor, Colonel Edward House, until she pointedly asked him questions at a White House dinner in a loud enough voice to gain everyone’s attention. The situation was soon corrected, at least for women in the Post Office. Ellen Wilson joined a committee of 50 to campaign for the passing of an bill that would destroy the slums and create better housing for Washington’s poor. She became interested in child labor laws, the enforcement of school attendance laws, and the use of schools as recreation centers. In the summer of 1913, Ellen went to join an art colony in Cornish, New Hampshire. The letters between husband and wife showed how much Wilson needed and depended on Ellen. Jessie’s wedding on November 25, 1913 in the White House was a moment of great joy but for Ellen, it depleted her small reserve of strength. In March 1914, Ellen fell in her bedroom which shook her already weakened body. The doctors by then knew she had Bright’s Disease, but she was not told for a long while. She begged her husband to see her bill passed and shortly before she died, she was told that the Alley Dwelling Bill had passed. Ellen Axson Wilson gloried in the achievements of women and saw the new century as the woman’s century. 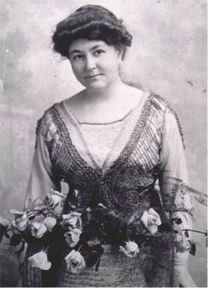 While devoted to her husband and his caree, Ellen Wilson saw nothing wrong with a wife having interests, opinions, and even a career of her own. She deplored anyone who reached middle age and had not expanded their horizons. While her time in the White House was short, she expanded the role of the First Lady to include civil responsibilities, to go out for one’s self to see the world, and to do what one could to make improvements. President Thomas Woodrow Wilson was born on 28 December 1856 at Staunton, Augusta Co., VA. He married First Lady Ellen Louise Axson, daughter of Rev. Samuel Edward Axson and Margaret Jane Hoyt, on 24 April 1885 at Savannah, Chatham Co, GA. President Thomas Woodrow Wilson married First Lady Edith Bolling, daughter of William Holcombe Bolling and Sallie Spears White, on 18 December 1915 at Washington, DC.1 President Thomas Woodrow Wilson died on 3 February 1924 at White House, Washington, DC, at age 67. [S95] Gary Boyd Roberts, Presidents 1995 Edition, Page 66. [S137] Elisha Scott Loomis, Joseph Loomis, Page 140, Item 64. Child of Anna Loomis and John Root Jr.